Lake Ann Pathway lies in the Pere Marquette State Forest and is known primarily as an excellent Nordic ski trail, featuring many loops and a rolling terrian. 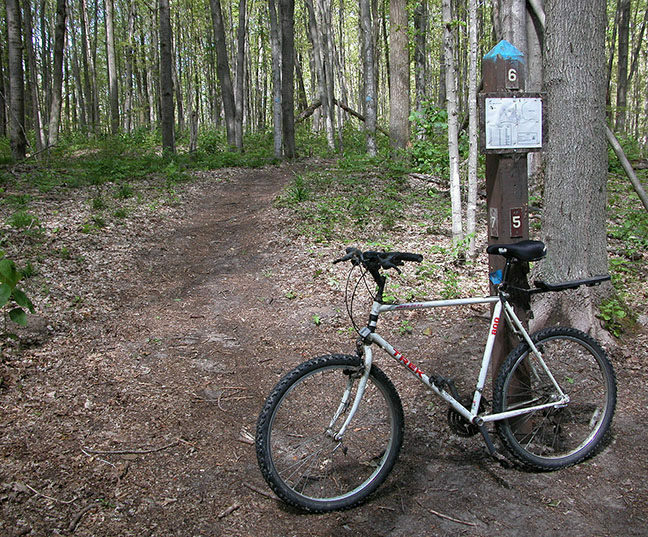 What started out as an interpretive trail in the late 1970s is now a popular multi-use trail with mountain bikers and hikers enjoying what skiers love; the scenic overlooks from the trail and the quiet nature of the area. In less than 4 miles, you view four lakes, skirt three bogs, and follow a stretch of the Platte River. 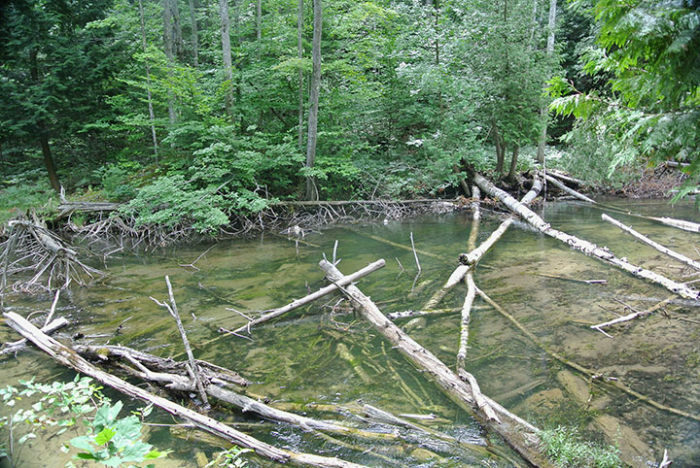 From swamps and lakes to a trout stream, few trails in southern Michigan display so much water in such a short distance. The hiking season runs from early May to late November, but keep in mind that the low-lying swamps and bogs found here are bug factories during the summer, especially from mid-June through July, and that a potent insect repellent is a requirement then. Fall colors are excellent, and the bogs are a profusion of wildflowers in the spring. Anglers will find the fishing difficult in the Platte, but Shavanaugh and especially the deeper Mary’s Lake can be productive at times for panfish and perch. The network is actually four loops. The first loop encircles the state forest campground for 1.8 miles on the on the east side of Reynolds Road and, while scenic in places, is not nearly as interesting as what lies on the other side of the road. West of Reynolds Road, the first loop is a trek of 1.2 miles from the posted trailhead; the second is a 1.8-mile walk. The entire circuit on the west side of the road is a 3.4-mile hike and, without a doubt, makes for the most interesting afternoon in the woods. The entire perimeter of the trail system on both sides of Reynolds Road is a 5-mile trek. From the trailhead parking area, the trail heads west, immediately crosses the first loop, then Reynolds Road and arrives at post No. 5. By heading north (right) at this junction, you’ll skirt a bluff forested in maples and oak, spot Shavanaugh Lake, and then descend to the water. You climb away from Shavanaugh and then descend to the shoreline of Mary’s Lake and skirt briefly before climbing a ridge to post No. 6, reached at Mile 0.6. Heading right at Post 6, the trail travels along a bluff above Mary’s Lake, but only quick glimpses of the water is possible most of the summer due to the foliage. 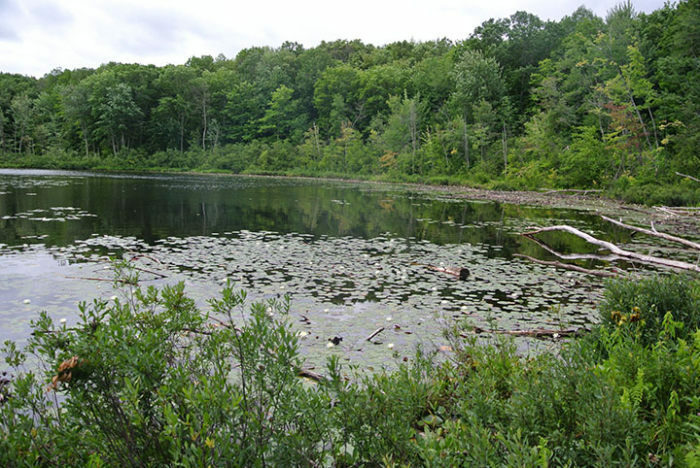 The trail crosses more hilly terrain and at one point breaks out to views of the low-lying wetlands that stand between Mary’s and Tarnwood Lake before descending to post No. 7 just before Mile 1. The second cutoff spur departs here for Post 9, which lies a quarter mile to the south. Head west (right) as the main loop resumes climbing, crossing a couple of hills before reaching the high point of 860 feet. There it’s possible to see both bodies of water that make up Tarnwood Lake and the swamp that lies between them. At this point, the trail swings 180 degrees to the south and follows the crest of a ridge that soon becomes a rapid descent to the bog below. The trail skirts the wetlands, quickly arrives at post No. 8 at Mile 1.7, then heads due south. You continue through the hilly terrain before descending to the Platte River, best known around the state as the first Michigan river to receive a planting of coho salmon in 1966. The trail swings east here and follows the river for the next 0.3 mile that includes a long stretch of boardwalk and a bench. On one side of you is a steep hillside covered with beech and maple, and on the other is the Platte River forested in cedar and tamarack. Eventually the trail swings away from the clear, gently flowing river and ascends the ridge it has been skirting and arrives at post No. 9 at Mile 2.7. Turn south (right), and the trail drops into the river valley again. Within a quarter mile of post No. 9, you climb to a bench along the trail overlooking the river valley. It’s a scenic spot even though trees prevent a clear view of the river itself. The trail follows the ridge above the river and shortly arrives at post No. 10, reached at Mile 3.1. The last leg back to post No. 5 (straight ahead) reenters the woods and passes a second bog. 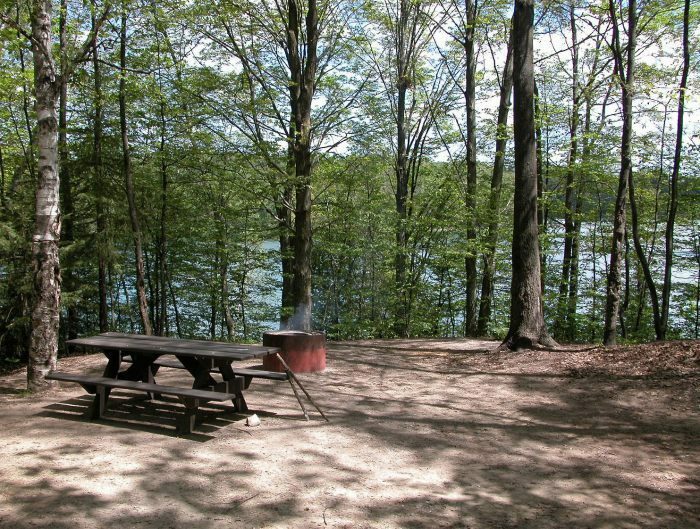 The pathway trailhead is located in the Lake Ann State Forest Campground, a rustic facility of 30 sites, many of which are on a high, wooded bluff overlooking the water. 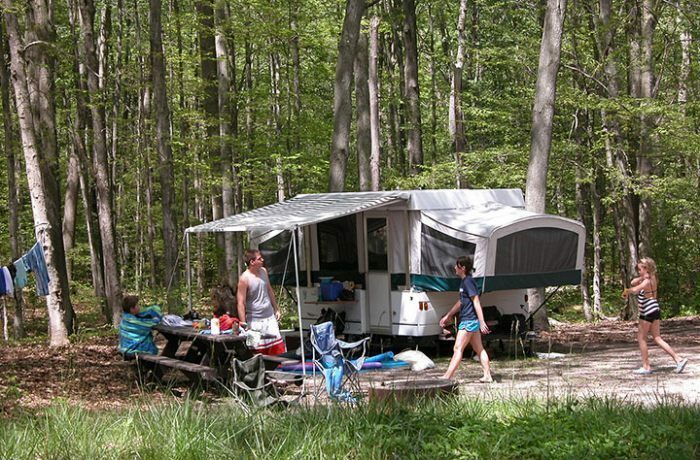 The campground has a boat launch but no developed swimming area, and there is a per-night fee for campers. Lake Ann Pathway is used year-round. A daily vehicle entry permit or an annual state park pass is required to park at the trailhead. 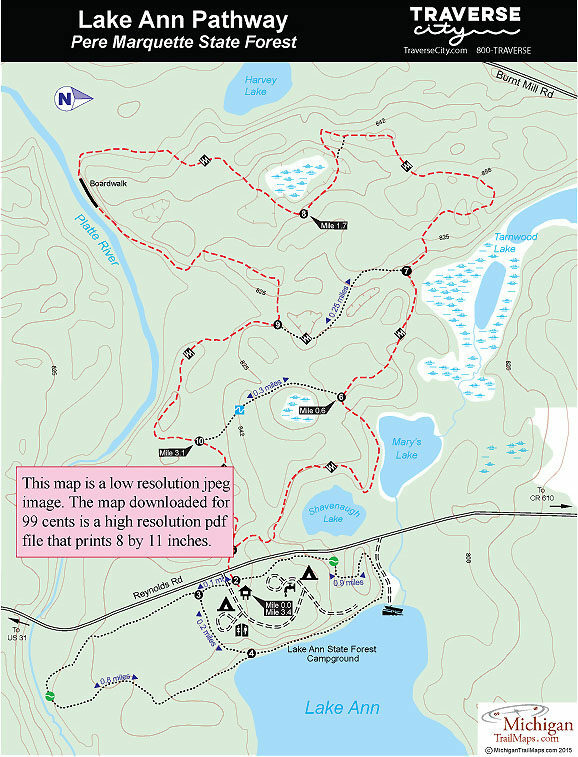 The trailhead is located in the Lake Ann State Forest Campground. From US-31, 18 miles southwest of Traverse City, turn north onto Lake Ann Road (County Road 665). This road ends in the small town of Lake Ann, where you turn west (left) onto Almira Road for 1.5 miles to skirt the north end of Lake Ann. Then turn south (right) onto Reynolds Road and travel a half mile to the campground. The campground is posted from both Almira and Reynolds Roads, and the trailhead is in a small parking area where post No. 1 with a map is located. For more information contact the Traverse City DNR Field Office (231-922-5280). For travel information contact Traverse City Tourism (800-872-8377; www.traversecity.com).